Off-Road Super Racing Mac is an action-packed truck racing game for those who love the speed and competition. Race your way through the championship mode, or just play free with the single races. Take control of a 4-WD racing truck in Off-Road Super Racing Mac. This challenging racing game offers a championship mode where you can reach for the gold medal and a free single race mode. This 3D-racing game is powered by a realistic physics engine to make it challenging for experts and easy enough for everyone else to try. The game features five different cars with 12 upgrades for each. Customise your racing truck in the garage with more than 100 unique paint options. By carefully choosing the right upgrades you will find the right balance for speed, acceleration, suspension and control. Use the nitro boost to race past your competitors in the race. 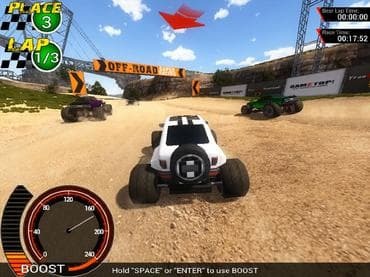 Off-Road Super Racing has six different tracks, all of which can be accessed in the single race mode. Make sure you are familiar with the race tracks before enter the championship mode. If you have questions about Off-Road Super Racing game, please contact us using this form.